Over stacked with fashion magazines on my living room side table. So much inspiration in one little corner. Though I often get tiered of wearing the same polish on my nails, and change it about every three days, I really liked this fun design I made on my nails. This was inspiered by a dress a saw in May's Elle magazine. I used a dotting tool to make the dots and free handed the "roses". I failed at the roses, but from far away you can guess they are some type of flower. Due to today's event I have to change my manicure to a classic red. I will be taking lots of pictures from today. My Fiance and I will be attending the annul 50th Anniversary Gala for his job. I finally found an elegant evening gown which I can't wait for him to see. Time to get ready! "Good morning loves! Starting of my day with a hot cup of coffee! So excited but nervous for today's big event. 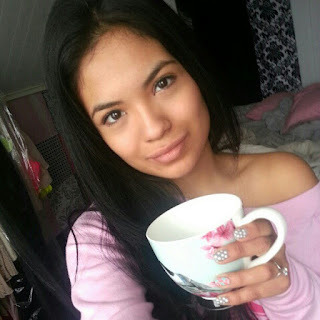 #nofilter #nomakeup #allnatural #coffee"